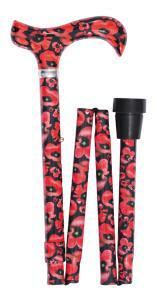 A striking height-adjustable folding derby featuring a vivid print of watercolour poppies. The poppy is one of Britain's best-loved wildflowers and is also a symbol of remembrance for soldiers who lost their lives in conflict. The poppy was adopted for this purpose after the First World War and the publication of John McCrae's 1915 poem 'In Flanders Fields', with its famous first line, "In Flanders fields the poppies blow". The naturalistic poppies are shown on a black background. This folding walking stick is height-adjustable from 79 to 89cm (approximately 31 to 35"), making it suitable for a wide variety of users. It is fitted with a chrome collar and a black, non-slip rubber ferrule. Item weight 315g. Ferrule diameter 19mm.